I love when I run into something that really stretches the bounds of my somewhat narrow definition of what “art” is and that happened this week when I watched the movie “Wasteland” on Netflix. 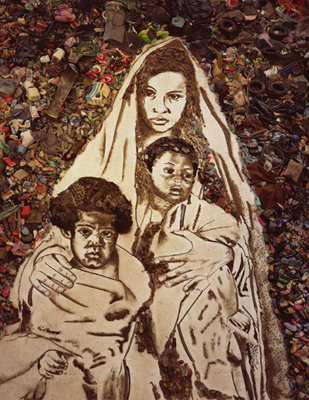 Vik Muniz is a Brazilian artist who makes large images from very unlikely materials; dirt, trash,chocolate syrup, sugar among them. Wasteland documents his three year project in the largest landfill in the world located in Rio. Each day hundreds of local people work there hand picking recyclables from mountains of trash to earn a living. It’s a true moving story of creativity, humanity, resiliance and the environment. The images Muniz created in collaboration with these people and the connections that were created through this art making are amazing to watch unfold. This entry was posted on May 12, 2011 at 7:37 am and is filed under Artists, Inspiration. You can follow any responses to this entry through the RSS 2.0 feed. You can leave a response, or trackback from your own site. Thanks Karen-it is on the top of our Netflix list. I corrected my email address above-the 1 was missing.